The ancient Chinese called this beverage the “Immortal Health Elixir”. 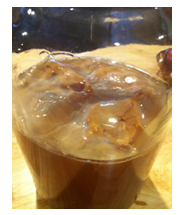 Kombucha is made from sweetened tea that’s been fermented by a symbiotic colony of bacteria and yeast (S.C.O.B.Y. ), a.k.a. “mother” because of its ability to reproduce, or “mushroom” because of its appearance. 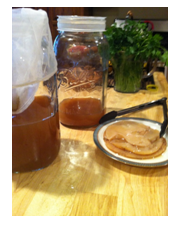 Start by acquiring SCOBY from a friend or on-line. 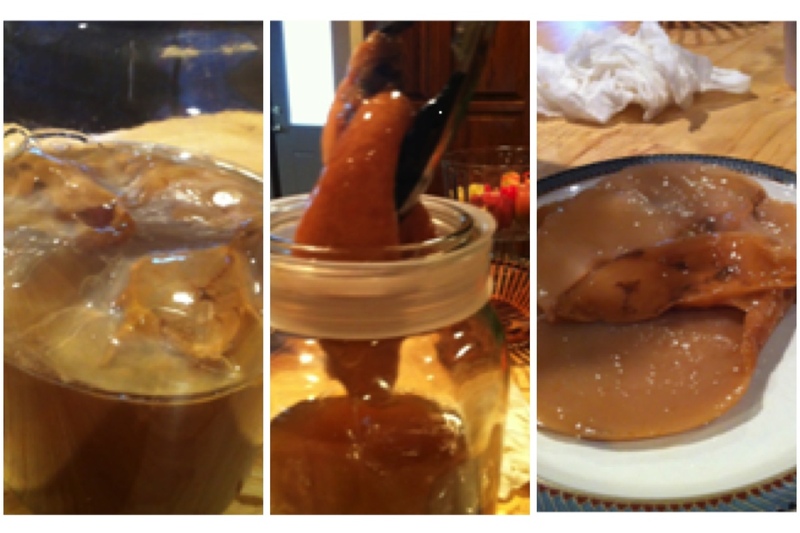 Once you get your scoby safely home remove the lid. Cover the top with cheese cloth or a clean rag and fasten with a rubber band. This will keep in a cool dark place for about 2-5 days. Do not refrigerate. 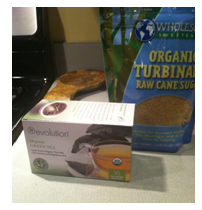 When you are ready to start, make tea with 3 quarts of filtered water and your choice of green or black tea. I am uncertain about herbal tea only because herbs are potent antibacterial. 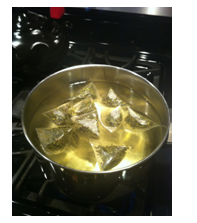 Allow tea to steep and then cool completely. Add ¾ cup of raw sugar; turbinado, coconut palm etc. Do not use a metal spoon to stir. A wood spoon is preferable. 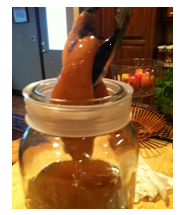 Poor into a large glass jar and add your scoby with liquid. Cover with a clean towel or cheese cloth and fasten with rubber band. Store it in a cool, dry and preferably dark place. My friend and I store it in our pantries. It gets periodic light and it is no problem. 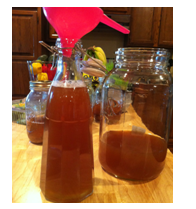 Allow to ferment up to 3 weeks. If it’s warmer in your pantry it may only take 2. Taste it weekly. Under 3 weeks is usually a sweeter tea and over 3 weeks you may lose the fizz. 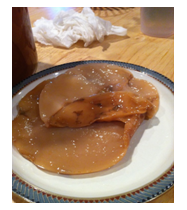 To make the kombucha; remove scoby to a plate with plastic tipped tongs. 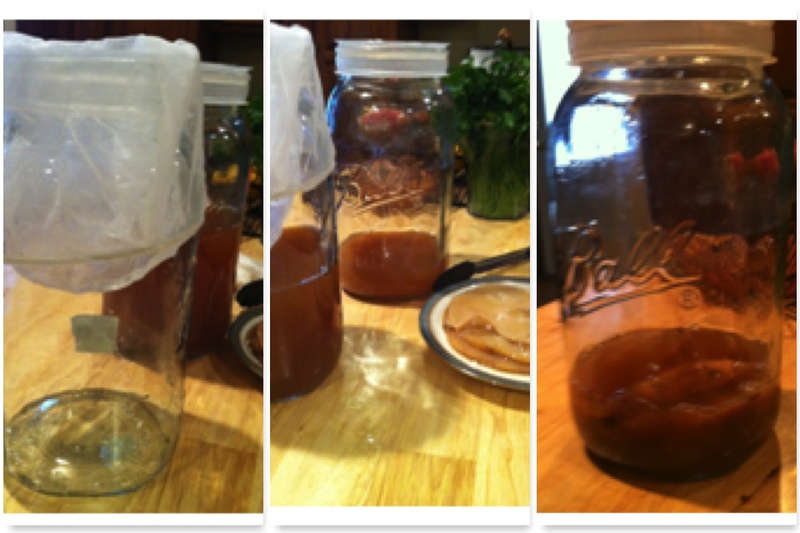 Here is when you would divide your scoby if you desire (it is not necessary on the first/second batch). 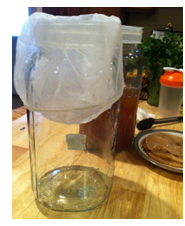 Filter your kombucha through a nut bag, cheese cloth or I used a 1 gallon paint strainer (super inexpensive from Lowes). 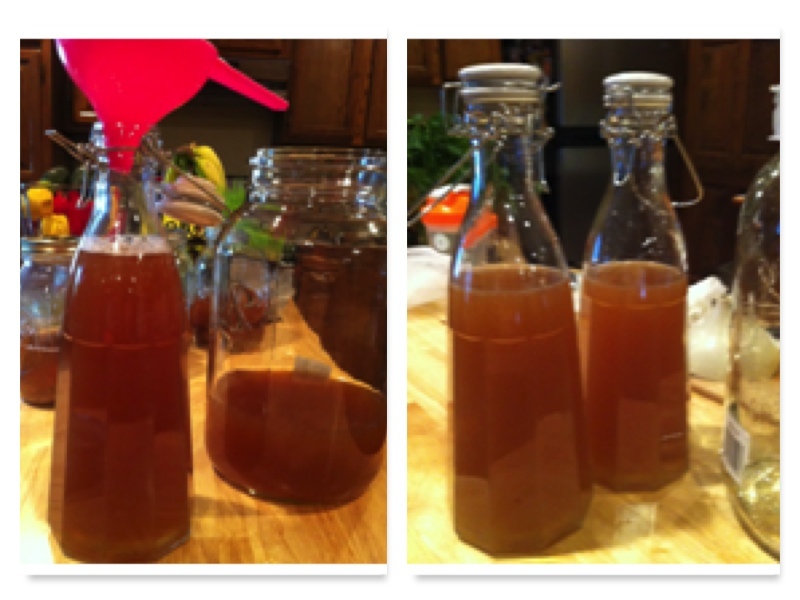 If you have cooled tea ready to go; you can filter all of your kombucha. 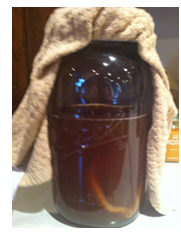 If not, reserve enough to cover your scoby when you store it back into the jar (cover as usual and store until ready with cooled tea). 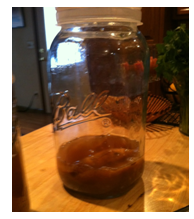 You can flavor your scoby in this large jar and refrigerate or bottle into smaller jars and create different flavors or drink as is. Store in jars that pour easily and have good seals. I found these at Bed Bath & Beyond. I love to put just a bit of ginger in ours. I’ve decided that it’s tangy enough so I usually opt out of adding citrus. I do like a ginger/pear combination. 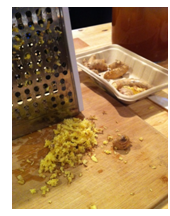 To add ginger simply grate fresh organic ginger until you have approximately ¼ of a cup. 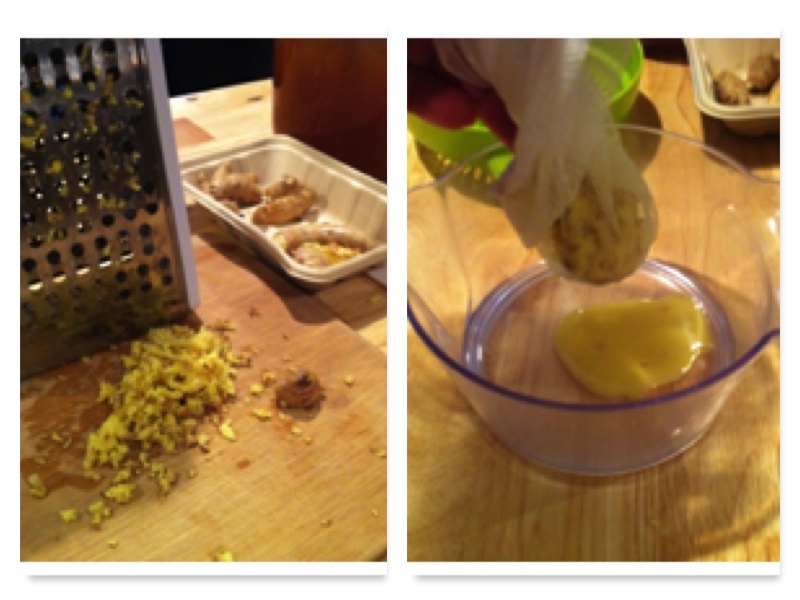 Put the grated ginger into your nut bag and SQUEEZE. You will get about 1 T of juice. I used this much for the whole batch. Repeat exact process with a pear! Save pulp from both for a smoothie. 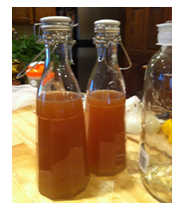 This entry was posted on April 17, 2015 by thrivecoach12 in Drink Recipes and tagged enhancer of vitality, Fairview Heights Nutrition, Health Tonic, herbal tea, immune booster, Kombucha, Pam Faulkner Recipe, potent detoxifier, probiotic, Thrive Coach 12 Recipes.